Arc flash, also called a flashover, is the light and heat produced as part of an arc fault, a type of electrical explosion or discharge that results from a low-impedance connection through air to ground or another voltage phase in an electrical system. 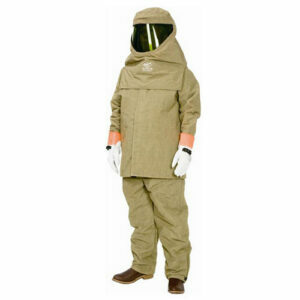 National Fuse Products offers customized safety training programs for your workers several times during the year. The instructor Jack Bene is a National Electrical Codes Instructor (licensed by the State of Ohio) and has completed over 125 flash studies for commercial and industrial facilities. 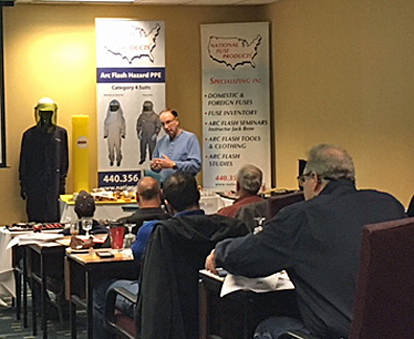 In addition, Jack has trained several hundred companies on arc flash hazards, shock and electrocution hazards, grounding, over current protection and general national electrical code topics. You can view Jack Bene’s complete curriculum vitae. Interested in attending an arc flash training seminar? You can either email Angie Graham at angie@nationalfuse.com or fill out our form on the Contact Us page. Another valuable protection device is the Fluke Infared Viewing Window which allows IR inspections without exposing your personnel to possibly catastrophic or fatal incident energy levels. The fuse industry has responded with new classes of fuses that reduce the incident energy, and the radius of any arc flash blast – which improves safety and reduces the level of personal protective equipment that workers are required to wear. National Fuse supplier Mersen, a world leader in current limiting fuses has four classes of current limiting fuses. Mersen arc flash fuses are type-2 no-damage circuit protection and are available in: Class CC, Class J, Class RK5, and Class L. Opening in less than quarter cycles under short circuit conditions, Mersen fuses limit enough current to prevent down time and arc flash damage. This arc flash calculator shows the benefits of Mersen current limiting fuses. The calculator uses IEEE calculations for the incident energy – which is much lower than older fuses – and references the level of PPE required which is less restrictive and more comfortable for your workers. The universal Class RK1 product family replaces a wide array of older fuses — and results in the least prohibitive NFPA70E arc flash boundary.